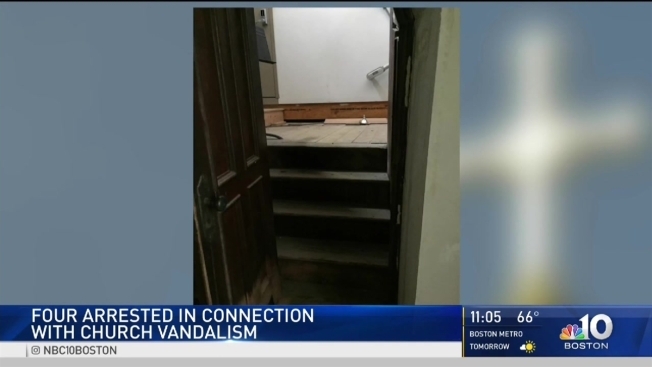 Four people are accused of vandalizing a church in Milford, Massachusetts, then posting photos online. Vandals busted doors and smashed up glass when they broke in to St. Mary of the Assumption in Milford, Massachusetts, early Friday morning. "They obviously are very troubled and have very sick minds," said Father Peter Joyce, the church's pastor. Church leaders say video posted by the suspects on Snapchat shows at least one of the vandals smoking marijuana on an altar. "I think that that's very common in our culture," said the pastor. "Social media is a way to flaunt what you can do ... it's just disturbing to what our culture has sunk to." Milford Police have arrested 21-year-old Michael Clifford, who lives nearby, and three juveniles. "I want to condemn it, but I also don't want them to be destroyed," said Father Joyce. "God is a God of forgiveness." The vandals allegedly rifled through drawers, dressed in clergy vestments and handled religious objects. "Profaning what we hold sacred," said Father Joyce. Church volunteers came in Friday afternoon to take care of the big mess left behind. "I did bless the church after everything was cleaned," said Father Joyce. "I went through to do a prayer that would dispel anything that evil, that was residue of their actions, to ask God to make it holy again." It doesn't appear as if anything was actually stolen from the church. All four suspects are facing several charges including destruction of property.